Mr. Gay mounts up Pluto the lion here at Gay's Lion Farm in El Monte, California. Mr. Gay seems a lot more gay than the lion…but then the only work he is doing is wielding a riding crop. 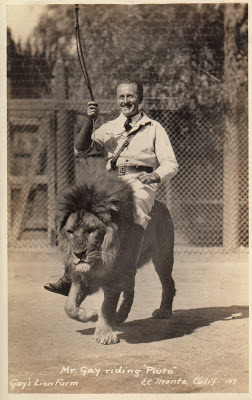 (Actually, I believe, a "quirt" but let's call it a whip) Gay's farm was some 15 miles north of LA and he supplied the movie business with lions. Puto was the grandson of Numa, a famous lion now stuffed. Well, back in 1930 stuffed, but Numa is probably no more. Numa worked with Charlie Chaplin (!) At one time, Gay's farm had TWO HUNDRED LIONS. A film of Mr. Gay in action (sorta) is shown below. That is one ticked off lookin' lion! How cool, now that is the kind of business I would love ... but I'm sure the chickens wouldn't. And Tattered & Lost is right, that lion does not look unhappy. I wonder what ever happened to Mr. Gay. Is this real photo? !